With one of the worst bullpens in the majors last season, the Atlanta Braves will be scouring the free-agent market for relief help this offseason. The 2015 numbers speak for themselves: Atlanta ranked among the three worst MLB teams in ERA (4.69, 29th), wins above replacement (-1.0 WAR, 29th), fielding-independent pitching (4.37, 29th), left-on-base percentage (70.4, 28th) and walk rate (4.02 walks per nine innings, 30th). Only the Red Sox, Rockies, and A’s ranked worse in any of those categories. Spanning from 2009 to 2014, the Braves featured the most consistent bullpen in baseball, and the statistics fully back that up. Over those six seasons, Braves relievers accumulated an MLB-leading 32 wins above replacement — more than three wins more than the second-place Yankees — and led the league with a 3.26 FIP, 3.06 ERA and 8.96 strikeouts-per-nine innings. Bullpen numbers almost always correlate with team success, too. In 2015, the 10 teams that made the postseason combined for a 3.60 FIP, which would rank 11th overall. Seven of the top 11 teams in FIP made the postseason. In terms of WAR, nine of the 10 playoff teams averaged 4.32 wins above replacement — which would have been good enough for No. 8 overall this season — with only the Rangers skewing that average down. Nine of the top 13 teams in bullpen WAR made the postseason. General managers have to address bullpens as one of the most essential parts of building a playoff-caliber team. After a season that left much to be desired, Braves president of baseball operations John Hart seems ready to revamp a bullpen that fell off in a severe way in 2015. "We can make significant improvements within our pitching," Hart said. "We’re going to, I think, have a bullpen that’s going to have a lot of depth. We’re not getting to get caught where we just didn’t have any experience, any depth in that bullpen. That’s what happened when (Jason) Grilli was lost and (Jim) Johnson was traded. We were in a very difficult situation." Fortunately for the Braves, two relievers within the organization are expected to return to form next season, which should instantly improve the bullpen in late-inning situations. "We’ve got some guys (coming back), Shae Simmons and Chris Withrow. … Withrow for sure is going to be ready for spring training," said Hart, who recently handed over general manger duties to John Coppolella. "Shae Simmons is going to be close behind him. He might be early May." Simmons, one of the Braves’ best relievers in 2014 with a 2.91 ERA over 26 appearances as a rookie, is recovering from Tommy John surgery and should immediately be one of the key setup men in the bullpen and could even compete for the closer’s role depending on his form upon returning. Withrow, who was acquired with Juan Uribe in the original trade with the Dodgers, put up back-to-back sub-3.00 ERA seasons with the Dodgers before undergoing Tommy John surgery and missing the 2015 season. His lively fastball should punch him right in to the back-end of the Braves bullpen. The Braves typically carry seven relief pitchers on the active roster. Simmons and Withrow will presumably fill two of those spots. 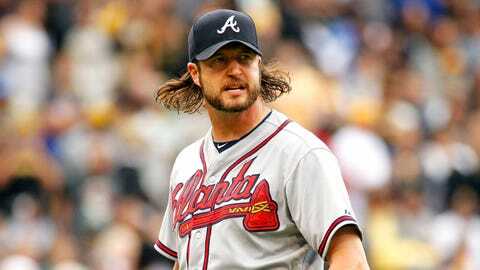 Jason Grilli should, barring setbacks in his rehabilitation process following an Achilles injury, return to the fold. With his strong finish to the season as the Braves’ closer, Arodys Vizcaino figures to have a spot in the bullpen locked up. Sipp is a veteran left-handed pitcher who has blossomed since joining Houston in 2014. With a 1.99 ERA and 2.93 FIP, Sipp has stranded 88 percent of runners in 2015. He’s due a nice pay day this offseason, but he could give the Braves a much needed left-handed reliever who is just as effective against righties as he is against lefties. Mujica had a rough 2015 season with the Red Sox and A’s, but the right-hander has playoff experience with the Cardinals and even saved 37 games with St. Louis in 2013. He figures to be an affordable option in free agency that can give depth to any bullpen. Even though Marshall didn’t pitch in 2015 and has only thrown 24.1 innings since 2012, he could be a low-risk, high-reward signing for a team this offseason. At one point, Marshall was one of the most dominant left-handed relievers in baseball, and he fits the trend in the Braves front office signing pitchers with an injury history that most teams passed up on. Kelley had his best season to date in 2015, emerging as a consistent bullpen arm for the Padres. Though he ran into some bad luck during his two years with the Yankees in terms of ERA, Kelley boasts a solid 3.55 FIP and a dominant 10.2 strikeout rate over his career. Albers is currently riding a 22 1/3-inning scoreless streak going into the offseason, and he could see a pretty hefty contract due to his stellar 2015 campaign. Though his FIP is much higher, Albers posted an impressive 1.21 ERA this past season and could provide some nice depth in the Braves bullpen.